At Disney's Animal Kingdom things have gotten a little crazy over in Dinoland. The Grad Students that work at the Dino Institute and reside in the Bunkhouse inside Restaurantosaurus have gone a little Dinosaur crazy. They have decided to add the suffix -osaurus to everything in sight. Although the menu in this Disney Parks restaurant isn't memorable it happens to be one of the best themed restaurants in all of Disney World. As the story goes, the restaurant includes the housing for the Grad Students who perform the serious research for the Dino Institute. When the Grad Students have time off from work, like all college students, they have a mischievious streak and like to have fun. One of the noticeable "improvements" that they have made is to add -osaurus to countless locations in and around Restaurantosaurus. Here you can see that this RV trailer has been tagged by the Grad Students with their signature -osaurus mark. The water tower is a favorite target. Not only has it been hit with plunger arrows, it has been marked with -osaurus next to the EAT that appears in big letters. Within Restaurantosaurus there are many signs that the Students have been hard at work. Here is a modification to an EXIT sign now reading "EXITosaurus." The crate in the picture above now reads FRAGILEosaurus! Check out the Wall calendar as the month is now JUNosaurus. Even the Grad Students' home base has been tagged as "BUNK ROOMosaurus." Where do you get your vehicle repaired? At the VEHICLE MAINTENANCEosaurus of course. 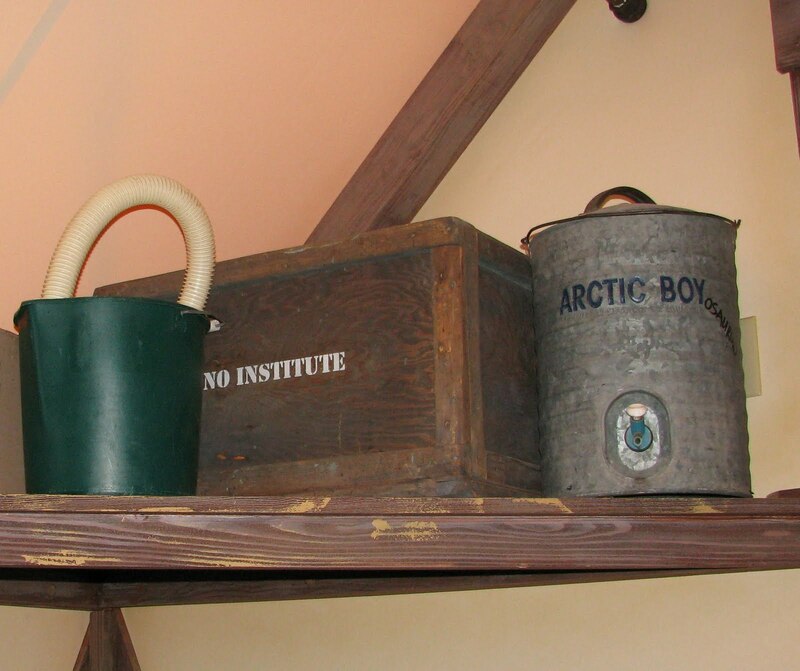 You can now get your drinking water dispensed from the ARTIC BOYosaurus container. Amidst the dinosaur sketches on the wall you can see your way out through the EXITosaurus! This is only but a fraction of the incredible theming that you can see if you visit the Restaurantosaurus restaurant in Disney's Animal Kingdom. Only WDWorld will have future articles sharing more of what you can find if you take the time to explore Restaurantosaurus and see all that these energetic Grad Students have been up to. If you are a fan of the wonderful storytelling and unbelievable level of detail that you find throughout the Disney Parks, then you owe it to yourself to take some time during your next Disney World vacation to explore Restaurantosaurus. You will not be disappointed. 2 comments to "Disney's Animal Kingdom Gets The Dinosaur Treatment"
Did you see my posts on some of the books the Imagineers left on the shelves?